Having almost come to the end of March we really didn’t expect too much in the way of Caddis action when we headed south again. How wrong one can be! Water had been down all night and was expected to be off during the day although there was supposed to be a slight blip at about 8am. The air temperature was creeping towards 60 and the water flowing at 46 after a cold night. One other car in the parking lot which was most surprising although once again the afternoon brought and influx of “fine weather” fly fishers to the stream. We decided to cross at the main riffle and head down the east bank of the first island where I dropped off below the second riffle to fish. My partner carried on downstream to the bottom of the island where we got such good action last week. The whole run was deserted which at this time of day was rather nice. A few small caddis were in the air and there were rising fish which had me reaching towards my Caddis box and a #16 Caddis adult emerger tied on a curved hook. I tie these to match the small tan Caddis and keep the wing fairly sparse but with enough to allow me to see it on the surface. 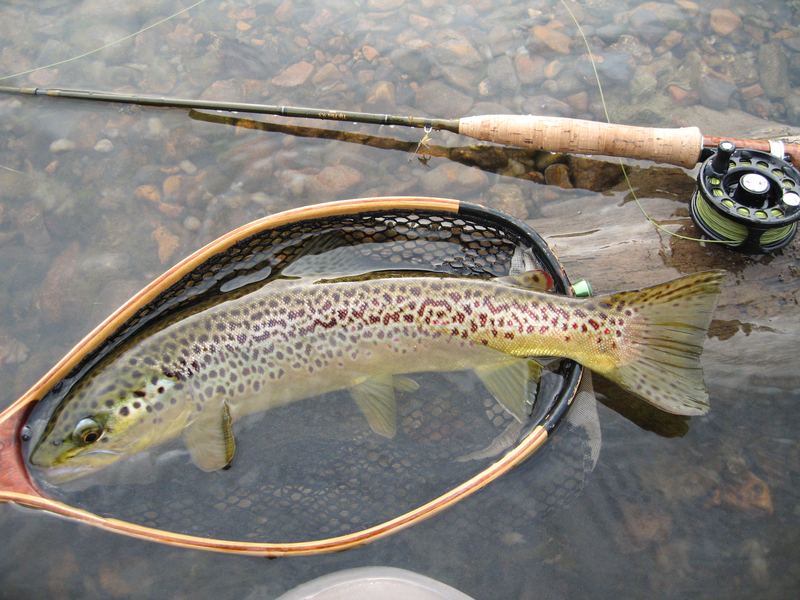 The riffle I was working had a large deep pool at the tail-out with nice agitated runs scattered across its width. The first rises were on the surface of the pool towards the tail and this was the area I targeted first. The first cast brought a fish cruising up from the depths and after a short fight I had a 16 inch Brown to hand! Initially the action was steady without being hectic and I had to work my casts around the pool taking actively feeding fish which were a mixture of average sized Rainbows and better sized Brown. After about an hour the Caddis began to make more of an appearance which seemed to coincide with the sun breaking through the clouds. As the Caddis appeared the fish began to move up into the shallow riffle water and feeding activity became very heavy with heads rising everywhere. The first good Brown I caught was 19 inches although something later happened that made me realize that there are some even bigger fish hiding. While I was retrieving a small Rainbow, a true “monster” emerged from the depths of the pool and attempted to remove my fish from the hook! He made a couple of runs at my fish and I wondered if I would be contravening the fishing regulations if I was to take him on a size 12 (inch) Rainbow!!! I had to pinch myself as the action heated up and I looked around to see that I had the stream to myself. 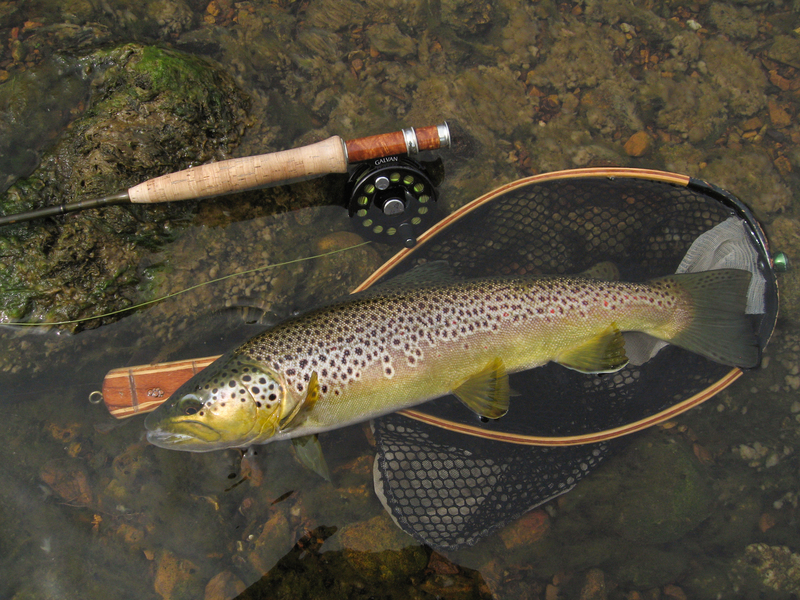 Dry fly action combined with solitude on the White River, truly amazing! My fishing partner had headed downstream to a favorite spot and appeared to be having fun although he reappeared about lunch time with a request that I join him downstream. I tried not to boast about the fishing but when I told him how many fish had taken my Caddis dry and that about eight of them exceeded 18 inches he decided to join me in my “fishing hole”! We spread out and by this time there were another half dozen other fly fishers in the run between the main riffle and the bottom of the first island. His first fish was close to 20 inches and this was followed by a couple more only slightly smaller. “Pretty crap here isn’t it” I said, “want to go downstream”? His laughter was enough answer so we decided to stay put. The tan Caddis of the morning were now being replaced by the white winged olive variety and a quick change of flies made sure there was no pause in the action. At one point we had almost a “blizzard” hatch and I was surprised to see that the return of the clouds didn’t affect the hatch. So much for my theory that it was the sun that prompted the hatch! As we approached the end of the afternoon there was a short discussion on persuading our wives that the car had broken down and we may need to stay overnight! Finally we decided that the needs of home were a tad more important than another day on the water, although both of us prayed that the Caddis would continue their mating ritual for another week – at least!! 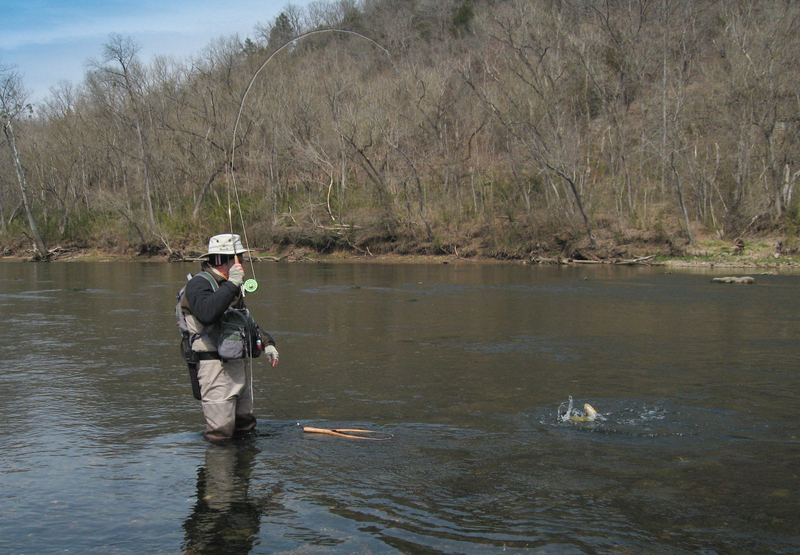 This entry was posted in Fly Fishing, Stream Report, Uncategorized and tagged arkansas, brown trout, caddis, casting, cotter, crane, crane creek, cutthroat trout, fish, fishing, flies, fly casting, fly fishing, fly tying, keith, mayflies, mayfly, missouri, Orvis, oxby, ozarkenglishman, rainbow trout, rim shoals, softhackles, spey casting, stone flies, stone fly, switch rod, table rock lake, taneycomo, teach, teaching, trout, white river. Bookmark the permalink.